The terms “agile” and “scrum” are used quite often in the IT industry, and they are often used incorrectly. Let’s have a look at the meanings of agile vs scrum. The main difference between the definition of agile and scrum is that agile is a set of principles, where scrum is a methodology. Many methodologies that adopt these principles are referred to as agile methodologies. One of these methodologies is known as scrum. Scrum implements these principles in a specific way, using things like daily stand-up meetings, sprint backlogs and retrospectives. It’s one of the more common versions of agile methodologies, and even has its own certifications. As mentioned above, scrum is built on the agile principles. However, it includes more detailed practices to be implemented for scrum projects. The scrum methodology uses interaction with a business user known as a product owner. This helps to achieve the “customer collaboration” principle. Short, daily meetings are used to promote interaction and to keep the project on track. Backlogs and reviews are used to respond to changes that are raised by new requirements or priorities. 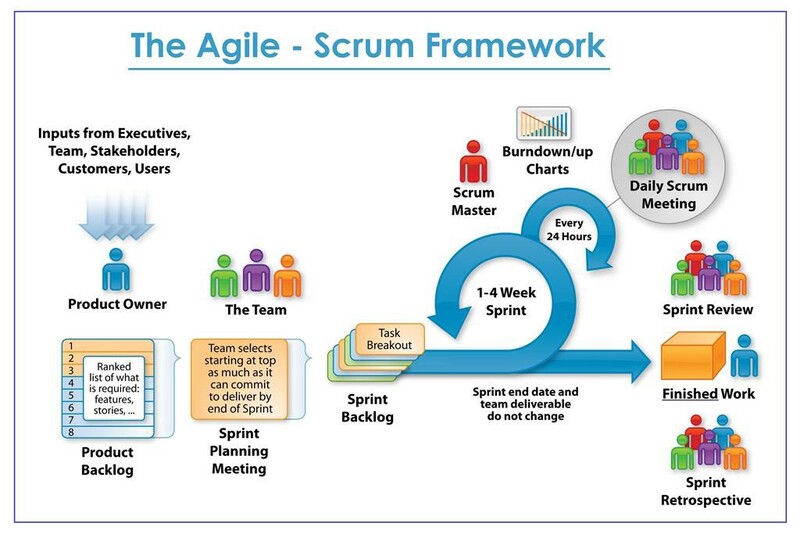 These detailed practices help make up the agile methodology called scrum. There are also several certifications offered in the area of scrum. I’ve highlighted one of those in arecent post on scrum master certification, known as the CSM (Certified Scrum Master). Other agile methodologies may use a different method to implement these principles, as we’ll see below. Agile and scrum are often used interchangeable as a way of delivering projects. This isn’t totally correct, as scrum is more of the methodology of agile and is comparable to waterfall. There are many alternatives to the scrum methodology that come under the agile framework – kanban, XP, and lean are just some examples. They all utilise the agile principles, but have different methods of implementation. Other traditional methodologies that aren’t agile include waterfall, spiral and iterative. While the iterative and spiral methodologies may be described as agile as they use smaller approaches, they follow the waterfall method rather than the agile principles. Agile doesn’t really have an alternative methodology. Broadly, agile can be compared to a traditional or waterfall approach. This is where waterfall refers to completing one stage before starting another, and agile refers to smaller deliverables with several items being worked on at once. I believe at this level, it’s the concepts that are being compared rather than the methodologies, which is where a lot of the discussion around these two methods are used.